Someone once told me a good physician is a good teacher and based upon my recent conversation with Dr. Huddleston, I can attest to that being true. With a calm and compassionate demeanor Dr. Huddleston spoke about his education from the University of California, San Francisco and his residency at the University of Connecticut, in Hartford. When he completed his residency, Dr. Huddleston accepted a position with CHC as a primary care physician. Little did he know he would spend the next 16 years growing not only as a physician, but as a key member of CHC’s faculty. Dr. Huddleston has a keen interest in HIV, substance abuse, and hepatitis C which has empowered him to work on a number of projects at CHC. He has spent the past 15 years working on the Ryan White Program, a grant CHC received to combat HIV and AIDS and deliver care and support to patients. Dr. Huddleston enjoys doing work around HIV because he is able to coach and teach very sick patients the best ways to combat their disease; in most cases he is fortunate enough to see his patients’ health turn around. 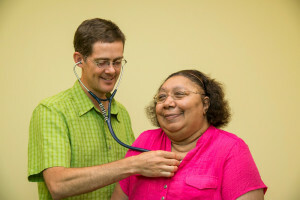 Dr. Huddleston has also spent the past five years as a faculty member for Project ECHO (Extension for Community Health Outcomes), a program that provides specialty support for primary care providers seeking to gain expertise in the management of certain complex illnesses and conditions. His main focus for Project ECHO is HIV and hepatitis C.
Dr. Huddleston views ECHO as a great resource to learn from and educate other primary care providers on certain issues. He values ECHO because it gives him the opportunity to keep up with all of the changes to medication, especially since the healthcare industry is changing so rapidly. Dr. Huddleston also values the opportunity he has to precept residents. It gives him the ability to educate them and shape them into exceptional physicians, but he is also able to learn from them. Dr. Huddleston shared with me that one of his favorite parts about working at CHC for so long is that he has the opportunity to see children and families grow. In some cases, he is the provider for all generations of a family. Dr. Huddleston truly enjoys coming to work every day knowing he has the opportunity to work with a wide variety of patients who have limited access to care. Fun fact about Dr. Huddleston, he rides his bike to and from work every day, rain or shine!